Last week, California became the first state in the U.S. to pass a law creating a double-digit minimum wage, with Gov. Jerry Brown signing legislation that will increase the current $8 per hour minimum wage to $9 next July and to $10 by the beginning of 2016. The move is the first for the state's wage since an increase in 2008 brought it to its current level. Unfortunately, even a boost to $10 won't necessarily address all the concerns that policymakers have about low-income workers. Costs of living are high enough in California that employees there need to earn more than in most states in order to make ends meet, according to figures from the Massachusetts Institute of Technology's Department of Urban Studies. Still, California's move renews a long debate about minimum wages and their impact on the economy. 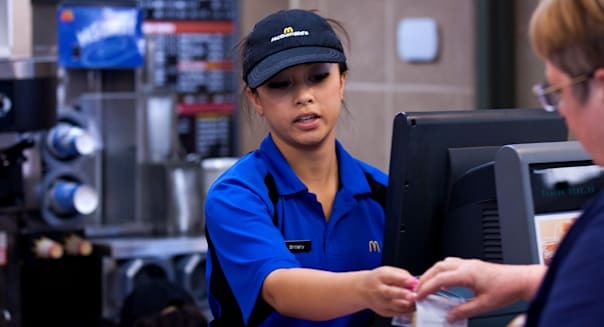 Opponents argue that higher minimum wages hurt small employers, reducing their ability to retain current employees and hire new workers. Proponents point to the need to pay employees enough to make ends meet, and as costs of living steadily rise, stagnant wages leave low-income families having to work harder to cover rising expenses. But as MIT's Living Wage Calculator reveals, the costs of living in California are high enough that even a $10 per hour minimum wage isn't sufficient for residents to meet even basic needs. Using estimates of costs for housing, food, transportation, medical care, and other expenses, the calculator estimates that even a single adult with no children would need to earn $11.20 per hour in order to cover basic costs of living. For families with children, the costs are even higher. Single parents see their costs more than double, requiring $22.70 per hour in order to earn enough to cover them. Added demands for housing, food, and medical care play a role in the increase, but child care represents another huge added expense. Even in two-parent households, a minimum wage isn't enough to make ends meet, regardless of whether the parents both work to earn the most income or one parent stays at home to reduce child-card expenses. Moreover, certain areas of California are even more expensive. In San Francisco County, for instance, it costs $12.83 per hour for a single adult to make ends meet, and more than $26 per hour for a single parent. The MIT calculator also looks beyond costs to determine what types of jobs pay adequate wages to keep families afloat financially. %VIRTUAL-article-sponsoredlinks%In California, most of the more modest-paying occupations -- including food preparation, personal care, sales, and office and administrative work -- don't pay enough to allow a single parent with one child to cover expenses. Instead, only those with better-paying jobs -- like in the education, health-care, technology, and financial fields -- enjoy typical hourly wages high enough to meet their money needs. There are places in the country where $10 an hour would be enough for some families to get by. In North Dakota, single adults can cover costs with a job paying $7.37 per hour, just above the federal $7.25 per hour rate that governs wages in that state. Similarly, two-parent families with one child can get by if they both work and incur reasonable child care costs. Yet even with California's recent move, efforts to boost the national minimum wage haven't made much progress. Given that more than half of states pay the same rate as the national minimum, a higher federal minimum wage would have a big impact on the entire nation. Meanwhile, policymakers will be watching in the years to come to see how California's increases will affect workers and businesses and how they interact.